I first tried spinach dip on my first date with my husband. I thought I was going to hate it – it’s full of spinach, after all – but I loved it! Twenty years later and my kids all love it too. 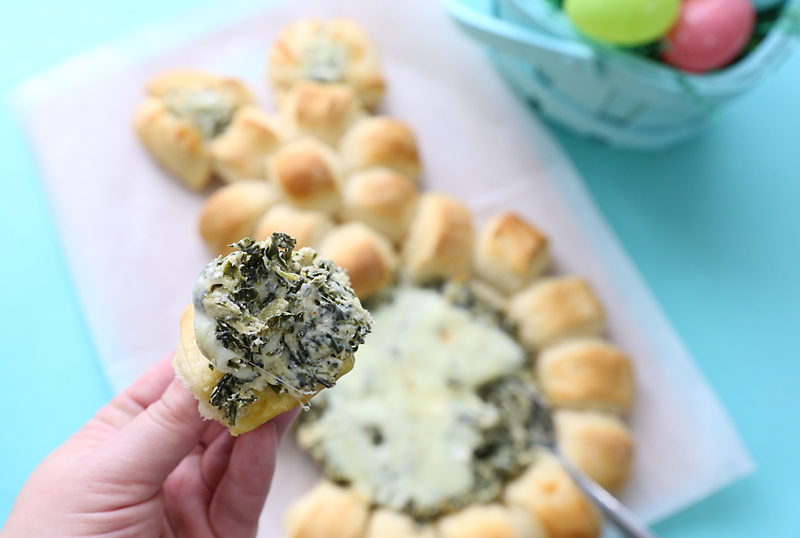 I made a spinach dip breadstick tree for Christmas and it was a HUGE hit, so I figured I better find a fun way to serve spinach dip for Easter. Hello spinach dip Easter bunny! 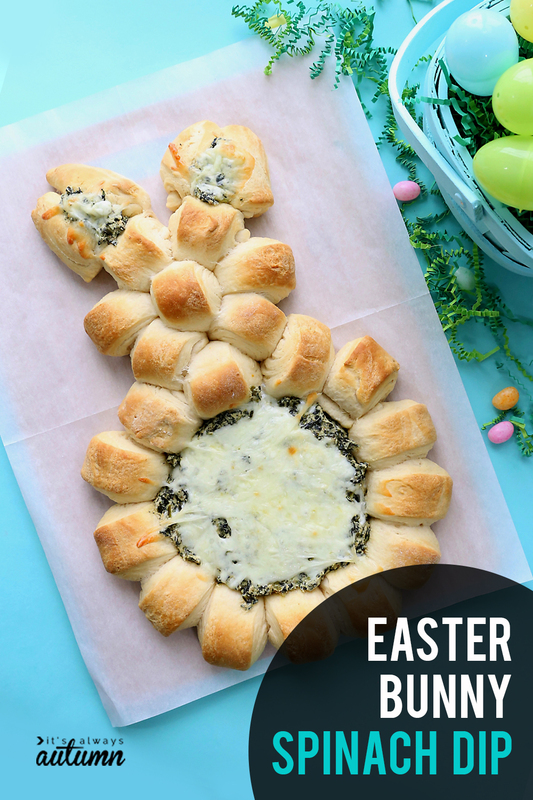 This is one fun Easter appetizer! 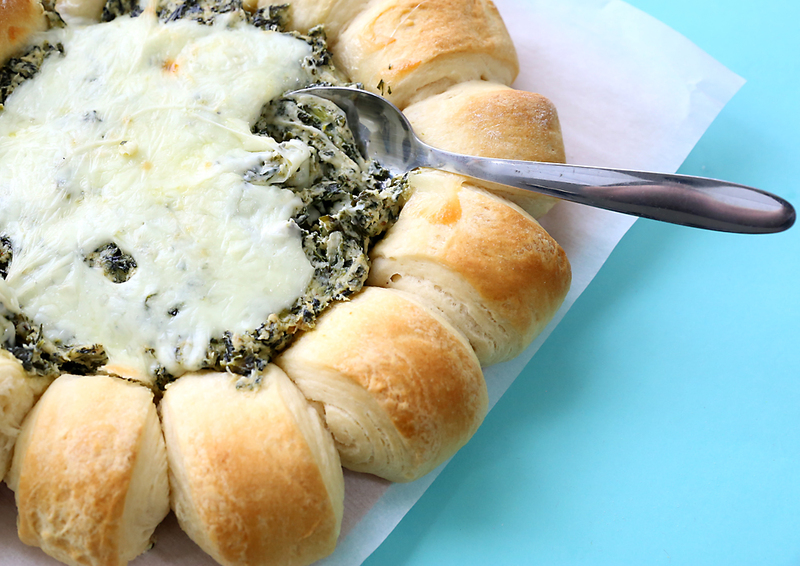 Hot, melty, cheesy spinach dip is surrounded by crescent roll bites that are perfect for scooping up the dip. The crescent bites actually act as a bowl for all that cheesy goodness, and they taste great smothered in the dip! 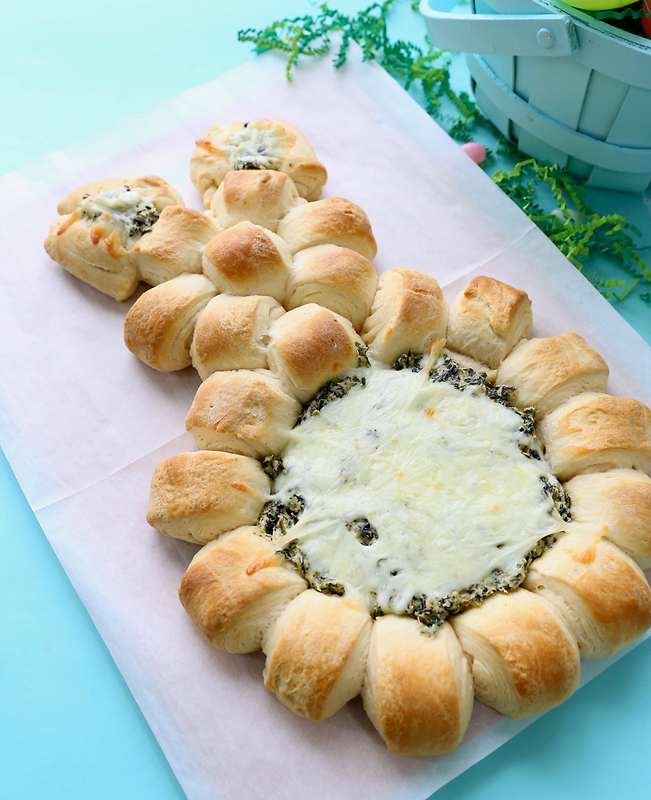 It looks a little fancy, but it’s really easy to put together using refrigerated dough and a simple homemade spinach dip that is FULL of flavor. The house smells so good while this is baking! 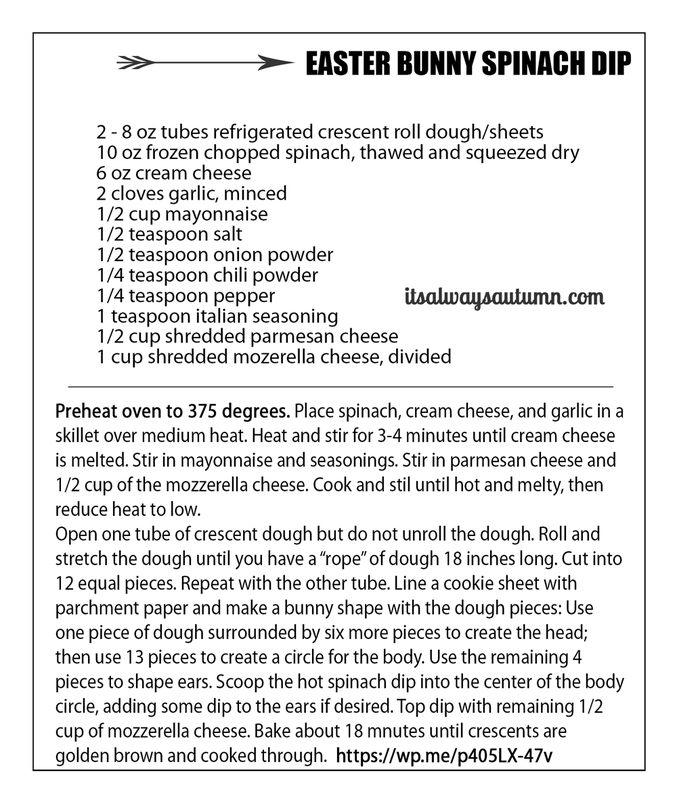 Click here to download the printable recipe card you see below. You’ll begin by making the spinach dip. Make sure to thaw the frozen spinach and then squeeze the water out of it. Cook and stir the dip ingredients as directed on the recipe card (remember, only half of the mozzarella cheese goes in the dip now). You want to get the dip nice and HOT. Then leave it on the stove over low heat as you shape the bunny. I used crescent roll SHEETS. If you can’t find those, I think plain old crescent roll dough should work. Pop that tube open and pull out the dough, but don’t unroll it! 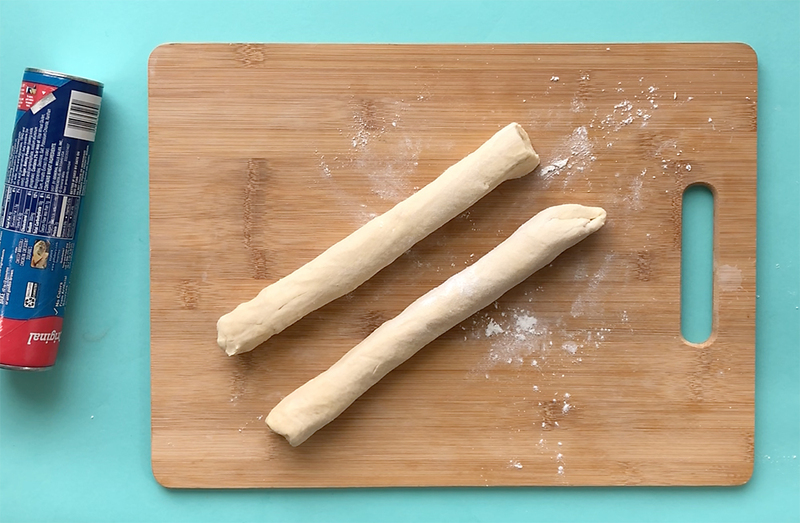 Instead, throw a bit of flour down on the counter and roll and pull the dough until you create a “rope” thats about 18 inches long. Cut it in half. Then cut each half into 6 pieces. 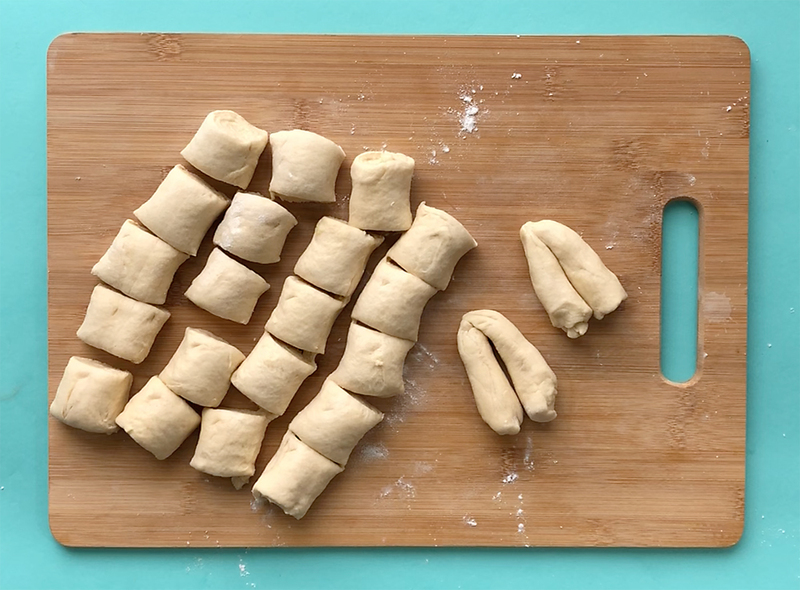 That gives you 12 pieces from one tube of dough. Repeat with the second tube of dough to get 24 pieces total. Use 4 of those pieces to create ears. Line a cookie sheet with parchment paper. 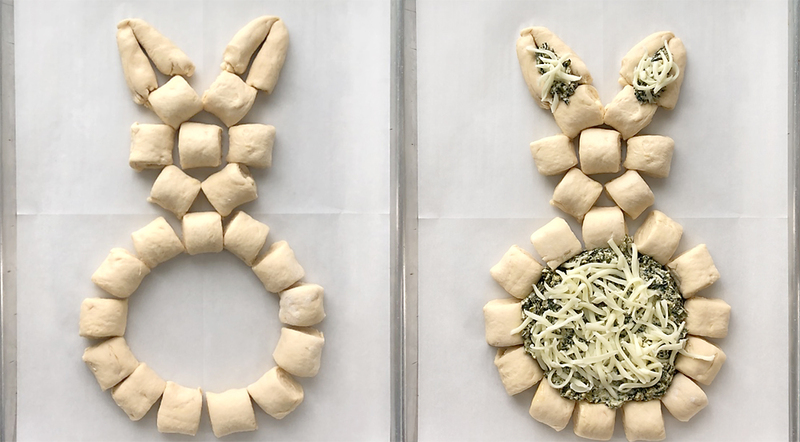 Create a bunny shape with the dough pieces, as shown below. At this point, make sure the spinach dip is still nice and hot. If it’s cooled, crank up the heat and warm it back up really quickly. Then spoon it into the center of the bunny, adding a little on each ear. Top the dip with the rest of the mozzarella cheese and pop the whole thing into a 375 degree oven. Bake time is about 18 minutes. You want to be sure the crescent dough is cooked all the way through, so let it get nice and golden brown before you take it out of the oven. You’ll want to serve it right away, while the dip is still hot and melty. Stick a spoon in the dip so people can scoop it up and then pull off a few of the crescent bites to eat with it. Ok, I know someone is going to ask: Can I make this ahead of time? The answer is probably not. You could certainly mix up the spinach dip ingredients ahead of time (just using a mixer would be fine) and keep it in the fridge until you’re ready to put everything together. Just be sure the dip is hot before you bake the bunny. This really does taste best served right out of the oven! 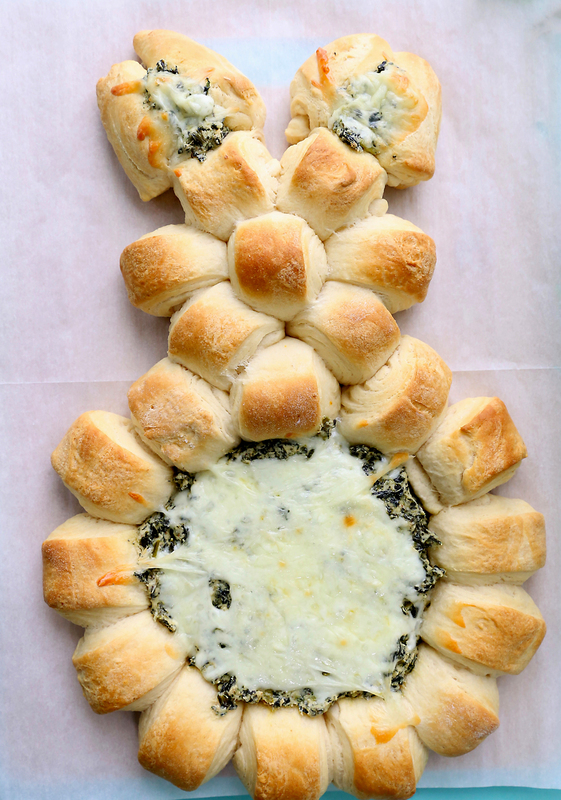 Be sure to check out the Spinach dip Christmas tree and the Nutella puff pastry heart! Its looking very yummy and crispy, i am impressed to see this recipe making process because its really easy for us. I am looking for the Mint Truffle Christmas Cookie recipe. You had a video on FB a while back but not the complete recipe. Thanks for the help. can’t tally how often I’ve made this cute Bunny Bread! For Easter suppers, parties, grills, lunch meetings, birthday celebrations, Mother’s Day, and so on, I’ve done it! What’s cuter than bunny-formed bread encompassed with new veggies and a plunge filled stomach?